Most good science fiction takes a single premise (which may or may not be believable) and spins out the consequences of that premise. To be convincing, there should just be that one premise, since most readers are willing to suspend disbelief for the sake of one implausible idea, be it time travel, faster-than-light travel, teleportation, or whatever. 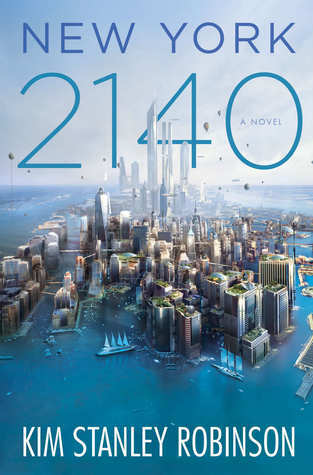 In Kim Stanley Robinson’s New York 2140, the single premise is that one result of climate change is a catastrophic rise in sea level by the year 2140, turning New York into a new Venice, 42nd Street Canal and all. At a mere 624 pages, this novel is a quick read, of course. Not about the length, which is indeed 624 pages, but about the quick read. It actually does move along at a good pace, but there’s no way you’re going to finish it in a day. A week will work. To give the narrative focus and to give the characters some depth, the entire book revolves around the residents of a single building, a former office building turned into coop apartments (above the fifth floor, of course). In some ways it’s a dystopia, but mildly so, considering the severe consequences of turning New York into Venice. Unsurprisingly (given the topic) there’s a lot of politics and left-wing economics in it, so don’t read it if you don’t like those topics. Also, like most science fiction, it’s more a novel of ideas than a novel of character development, so be warned. It’s definitely not as bleak as you might assume, since Robinson has leavened the tale with a good dose of humor and several amusing characters. I also learned a lot from it, although the author mostly succeeds in not being too didactic.